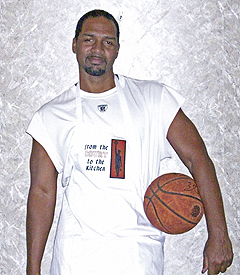 thank you for that wonderful article…and all from a non-sports fan to boot! I have been grinning from ear to ear and have read the article over and over again! To go against Angelo’s and do well is awesome. Here is a little tidbit that you were not aware of. I was trained by Tom Z, which is Angelo’s cousin. Tom worked for Angelo for the better part of 20-30 years and this is why the my spice is similar in flavor. However, you tasted that “little something different” in my spice and I put a lot of time into developing not only my coney spice, but my full line of spices! I look forward to the rest of your results as well. 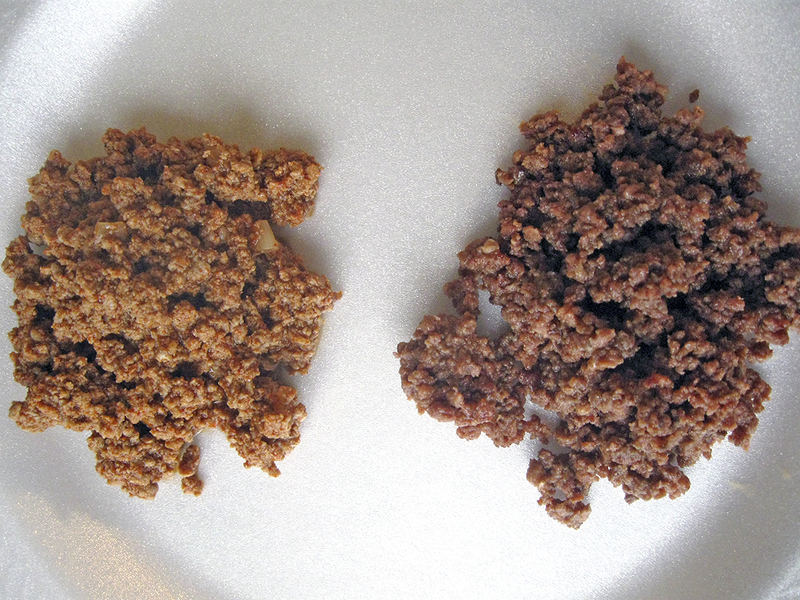 I wanted to make my coney spice so that it could be used with any ground meat. The only thing that I didn’t try it with was Tofu and that little experiment is coming soon! Again, great article and I appreciate the thumbs up! All the best … from one coneyhead to another! 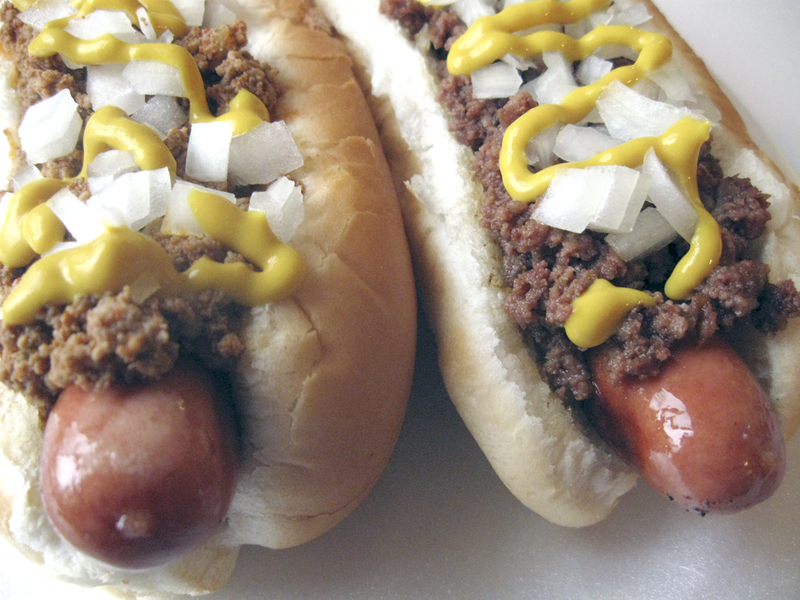 On the left is a coney made with Marty Embry’s Flint Coney sauce. 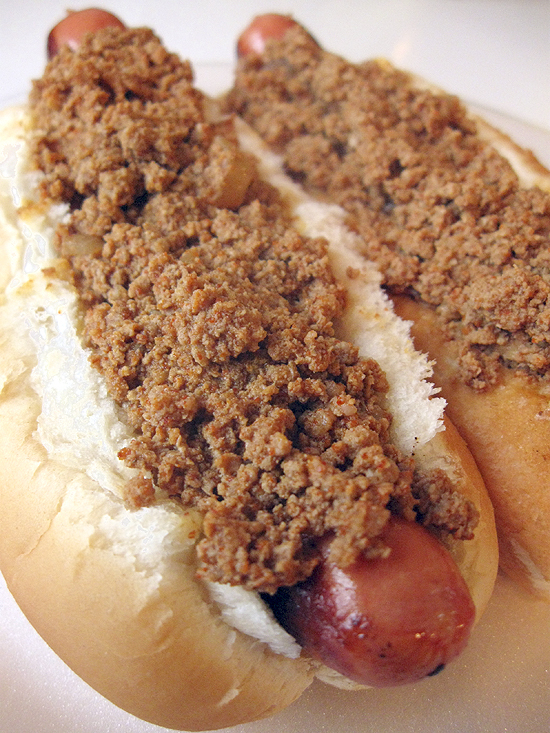 On the right is a similar coney, but topped with Angelo’s original sauce. I gotta say this at the beginning: I really don’t like basketball. I’m a computer geek, have been since 1976, a hardware geek since 1983, and a food geek since I last saw my 34-inch waist in 1989. I’d go to basketball games to watch my daughter and her team cheer when she was in high school, but the last time I saw a basketball game myself George “Meadowlark” Lemon had probably just turned 40. (He was born in 1932, so you get the idea.) It started as an embarrassing moment at Flint’s former IMA Auditorium. Meadow was yelling things at the crowd, and suddenly dad harassed the man right back just as loudly. I was shocked when the Clown Prince got right into it, and he and dad were yelling back-and-forth off-and-on for the remainder of the game. I haven’t had that much fun at a basketball game since. If you follow basketball, you may know Marty played at DePaul in Chicago in ’82 and ’83, then went off to play pro ball in countries such as Spain and Italy. So what’s he doing here? 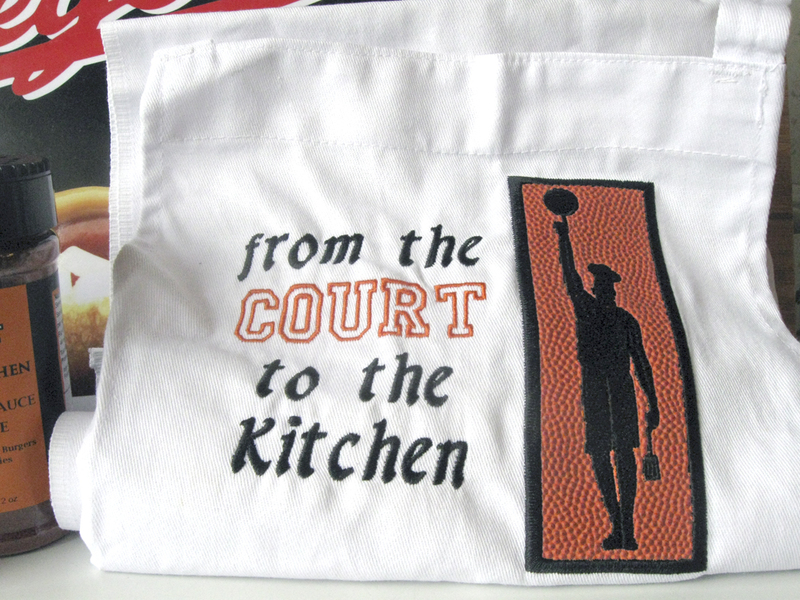 A ‘From the Court to the Kitchen‘ apron. The orange material with the sillouette is basketbull surface material. Marty and I met on Facebook in early 2010 and discovered we are, as Marty puts it, “fellow coneyheads”. He’s probably more an aficionado of Flint-style coneys as I am, and has spent considerable time developing his own recipes for an authentic sauce. However, instead of simply giving the recipe away as I have, Marty’s taken his concept a step further. After running a coney restaurant in Flint for a while, he’s now bottled his Coney Sauce Spice and is offering it online so anyone anywhere can make an authentic Flint-style sauce at home without much trouble at all. Three jars of Marty’s sauce in our kitchen, along with some Koegel Viennas. 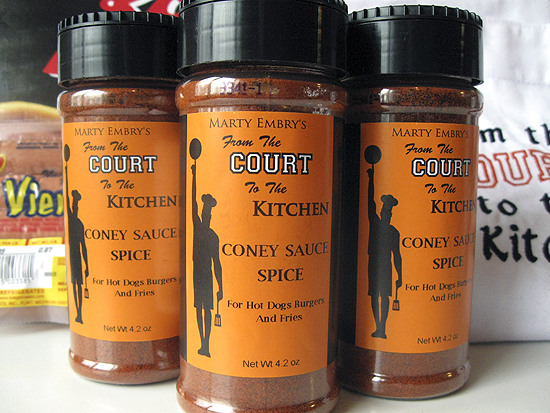 I ordered some of Marty’s jarred Coney Sauce Spice from him and planned to make a batch. But then something occurred to me: We were planning on being in Frankenmuth to take my sisters to Zehnder’s Restaurant for a late Christmas dinner. That meant we would be driving through Flint twice. The question then became this: Marty says sauce made with his mix is as authentic as you can get without going to Angelo’s. So does it? There was only one way to find out. Heading into Frankenmuth we first stopped at Kern’s Sausages, which is south of Zehnder’s by about a mile. The butcher there packaged me up a fresh-ground pound of 85/15 ground beef for use with Marty’s mix. After eating at Zehnder’s with my sisters we headed down Dort Hwy, hung a right at Davison Rd., and headed straight for the personal Mecca for many: Angelo’s Coney Island, two blocks down from my old apartment on Franklin. After shelling out the money for a quart of still-warm sauce, we headed south with that amazing smell wafting through the van. Early the next afternoon I started working through the matchup. About a cup of the original Angelo’s coney sauce simmered slowly in a small pot at the back of the stove. I cut that whole darned onion, knowing I wasn’t going to use it all but just really enjoying the smell of a good onion. Not some el-cheapo from a chain grocer that had been in the bin for a week, this onion was crisp, just a touch juicy, and the odor sent me out of the kitchen a few times. Mary commented from the living room about how nice things were smelling. To get the consistency correct, Marty directs users to add warm water to the ground beef, then mix it by hand. He writes, “The mixture will be soupy, like a melted milk shake.” I thought this would be a bit on the strange side, however it turned out to be exactly what was needed. I’m not going to go into all the details here of making Flint Coney Sauce Marty’s way. Basically, it’s the onions, beef and water mixture, and his spice mix, along with the techniques he describes on the jar. It couldn’t be simpler. Flint Coney Sauce made with Marty’s spice mix and techniques is on the left. The sauce on the right is Angelo’s Original Sauce. At first glance there’s a serious difference in color. Having made Flint Coney Sauce with heart and kidney included, and having tasted the Angelo’s sauce this afternoon, I can unequivocally state the color diffence is because most people using Marty’s spice mix will use only ground beef like I did this afternoon, while the Angelo’s sauce obviously contains the same organ meats I used in an earlier recipe. In those earlier experiments I found this same color difference. In the above image it’s easy to see the textures of the two sauces are almost the same. Marty’s trick of adding water and mixing to milkshake consistency is, as I said, quite accurate. The two coneys in the top pic of this post were the two coneys I ate for lunch. The spicing of the two were virtually identical. Marty’s did seem to have a little extra “something” that I couldn’t quite put my finger on. But it was a “good” something, so that was fine. Use small strainer to dip coney sauce out. Let juices drain for 6 seconds. Flip coney sauce in the strainer 6 to 8 times, and use 2 Tbsp per hot dog. There’s a caveat in all of this. It’s the organ meat. Angelo’s sauce to be found here. Once I photographed these, they went to Mary. If there’s one thing I’ve found it’s that, if someone hasn’t grown up on the sauce made with organ meats, they really won’t like it. When Adam and I finally completed the version of my sauce made with the beef heart and kidney, Briahna and Mary both turned their noses up at it. The flavors of the organ meats were just enough to turn them off from it. Subsequently, others have said the same thing about that particular version. This made me wonder about an incident that happened at the Beachhouse that summer. 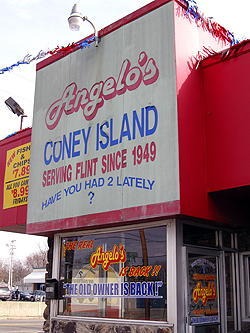 A few twenty-somethings got out of a car, looked at my sign about Flint-style coneys and one guy laughingly yelled, “We’re trying to get away from Flint!” It turned out they had eaten at Angelo’s the day before. After eating my version, that same guy told me my version was better. It may very well have been that he didn’t like the organ meats. My favorite coney was at the Original on Saginaw by the river. The was another coney next door that also served burgers. When working at Buick we would slip out to Angelo’s. Not big on Detroit style. There used to be a Westside Coney on Corunna Rd. and a Detour Drive In on US 23 south of the US 23 drive in theater. My favorite from coney’s that only should coney’s and chili as basics is still the Flint Original Coney, the go to after a movie. Hi Lynnette … The original recipe for Flint Coney sauce using beef heart was apparently based on a Macedonian “goulash” from the 1800s which likely would have included kidney. As original “nose-to-tail” eaters the Macedonians wouldn’t have minded the minerally organ flavor, and probably wouldn’t have cooked it twice. It’s only the later western civilations, who’ve become rather squeamish, who would have looked for that technique.